This Blender Was Designed To Do Everything! 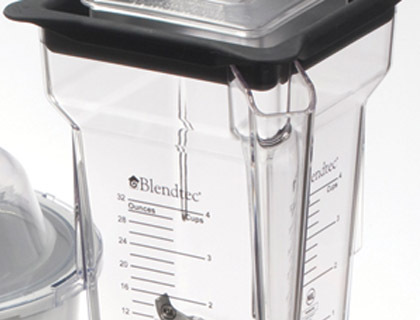 There are two things that make the BlendTec Mix Blend II Blender Mixer Combo one of the best blenders on the market today: versatility and power. It packs an amazing 1,000 watts of power, which simply blows the competition away and puts it on a level all its own. That is impressive, but its versatile functioning is even more impressive. Mixing is done in a bowl that holds up to 4 quarts and blending is done with a 64 ounce pitcher. The system is designed to handle loads big and small, giving you the ability to whip up a small batch of cookie dough, blend fresh squeezed juices, and knead dough for fresh bread all with one machine. 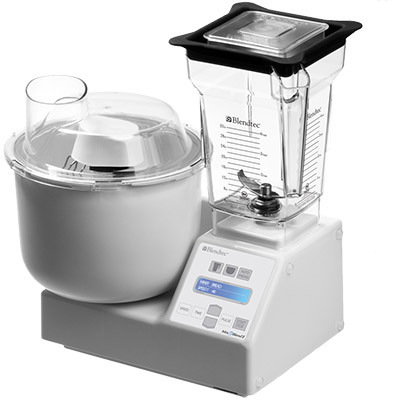 The dough setting is one of the most impressive features on the BlendTec Mix Blend II Blender Mixer Combo. The machine actually kneads the dough for you, shutting itself off at the perfect time. You never have to guess when the proper gluten level has been achieved because the blender tells you! You can also chip ice and make your own salad dressings and sauces on top of all the typical blending and mixing jobs you come across in your kitchen. This is clearly one of the most versatile blenders on the market today. 1.8-peak horsepower motor at 1000 watts. 8 custom pre-programmed cycles with automatic shutoff. Mixing bowl, pitcher and attachments are dish washer safe. 3-year extended warranty on motor. 1-year warranty on blender pitcher. 4-quart mixing bowl and lid. 64-ounce blender jar with lid. Dimensions: 15 H" x 10.75 W" x 7.75 D".